Malini has mastered the state-of-the-art progression. True to her globe trotting nature, her theme picks the fluidity and submissiveness from the known and unknown materials. The collection exhibits an entirely different era. One can call it the transition mode—the Indian Classical music transcends into pop and the silhouettes also flow from basic opaque to flowing forms. The swimsuits were teamed up with fringed boleros. The fringes were emphasized in an engineered manner—they were played over with multi colours. The cuts were sexier and revealed mysterious elements. The collection had a very enigmatic approach when the halter-backs were showcased. There were nice cuts at the waist and empire-lines. The Black and white dresses in chiffon and satin gave a marvelous portrayal of soft feminine elements. Once again the jumpsuits were straight and linear. The tie and dye effect was an eye-catching episode of entire collection. The designer created Ombre gradations with the blues and whites. 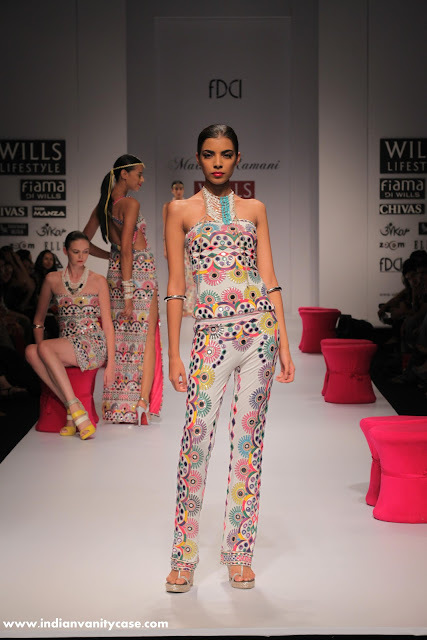 A fresh look with multicolor scalloped thread embroidery and mirror-work was created, which was sure not to be missed. There were jumpsuits, halter dresses with multicolor embroidery on off-white bases. Another highlight was the large slits on the dresses. Finally there was a gust of fresh air with eye-soothing green. 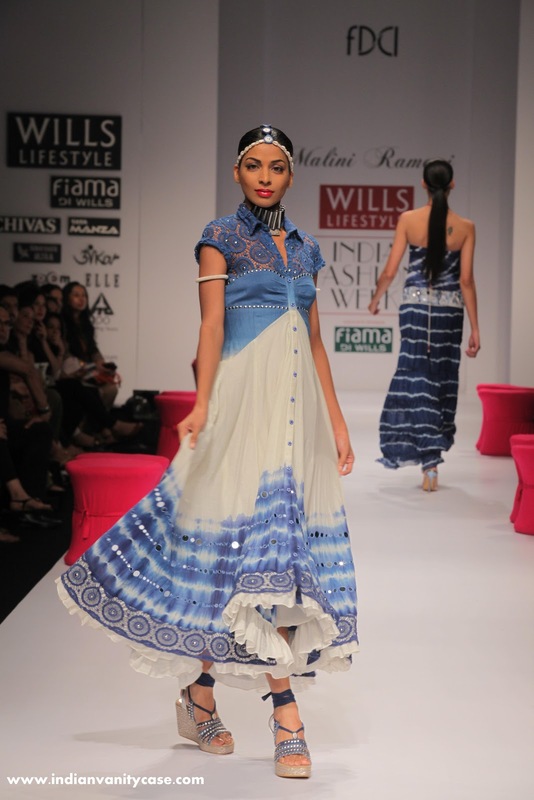 On the whole, the collection depicted Malini’s signature style.